Genesis, the new luxury arm of car manufacturer Hyundai, has just announced that its cars will be able to take commands from the Google Assistant. Gone forever are the days of having to wait until you are actually buckled-up to set the thermostat. Now the next time it's a bit warm out, you can let Google know to start your car and turn on the AC. This integration comes apparently courtesy of the Genesis app for Android and iOS, which is able to take commands via the Google Assistant. It even works with Google Home, if you have one. The full set of commands is, unfortunately, pretty short. You can set a destination for your nav system, remotely start the car, set climate control, remotely lock/unlock the doors, and blare your horn and lights. For security, it will ask for a PIN when issuing commands. You'll also have to link your Genesis Connected Services Account. At least the price-tag for a Genesis includes 3 years of connected service. Obviously, someone will have to review the Google Assistant integration. Sometimes you just have to take one for the team. I'll guess I'll even settle for the G80. 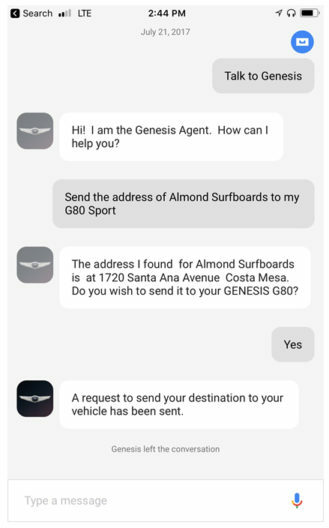 FOUNTAIN VALLEY, Calif., Aug. 16, 2017 – Genesis Connected Services is getting a lot more powerful with the introduction of the Genesis app for the Google Assistant today. 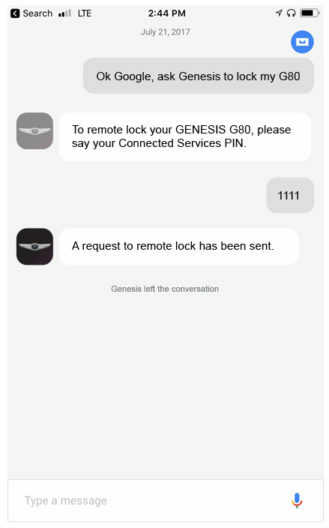 All Genesis vehicles are equipped with three years of complimentary Genesis Connected Services, which allows connectivity into the car with technology like Remote Start with Climate Control, Destination Search powered by Google®, Remote Door Lock/Unlock and Stolen Vehicle Recovery. The Genesis app for the Google Assistant allows control of various functions of a Genesis vehicle with simple voice commands or smartphone keyboard inputs. 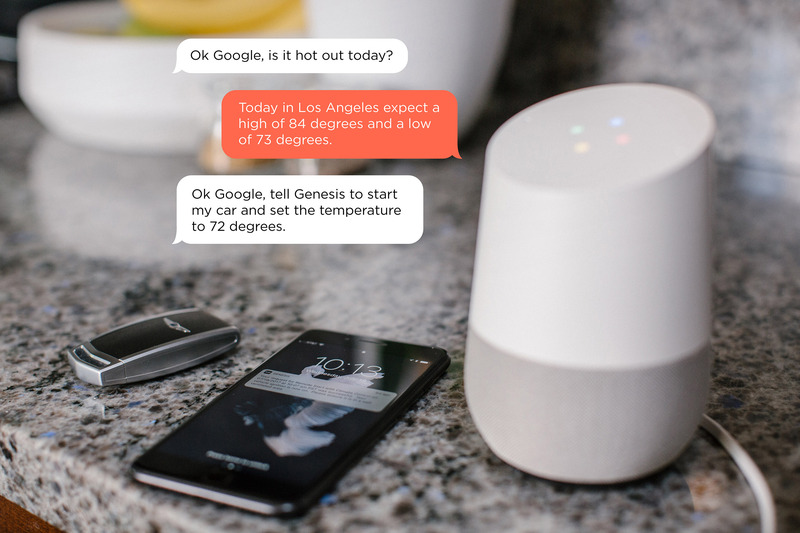 To send commands to Genesis Vehicles via the Google Assistant on Google Home or a smartphone, engineers developed a way to link a customer’s Genesis Connected Services Account with the Google Assistant voice activated services. Once a customer has successfully linked his or her account, Remote Service commands can be sent to Genesis vehicles only after the Google Assistant prompts owners for their Connected Services Personal Identification Number (PIN). All of these features, in addition to the recently launched Genesis Virtual Guide, will be available to demo at the second annual WIRED Store in Santa Monica from August 23 through September 4, 2017. The luxury pop-up, presented by Genesis, offers a chance to experience new product demos blending the smart home with the smart car, and is the exclusive demo site for new smart features of the 2017 Genesis G90 — the Genesis flagship sedan, which focuses on combining human-centered luxury with cutting-edge innovation. For more information on the WIRED Store please visit http://store.wired.com or follow @WIREDInsider.